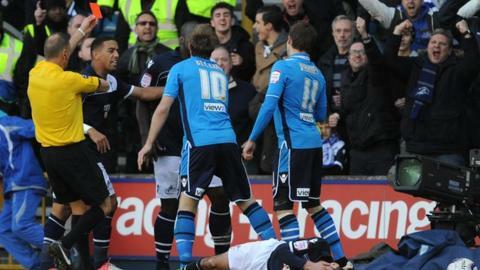 Chris Wood scored the only goal of the game for Millwall as they beat 10-man Leeds in a tense encounter at The Den. Leeds' Luke Varney was dismissed early in the second half for an elbow on Adam Smith after a goalless opening period. And from that moment on, it was the home side who dominated possession and should have won more comfortably. The visitors, who created few chances throughout, held on until Wood met Shane Lowry's tantalising cross to head home the winner in the 86th minute.